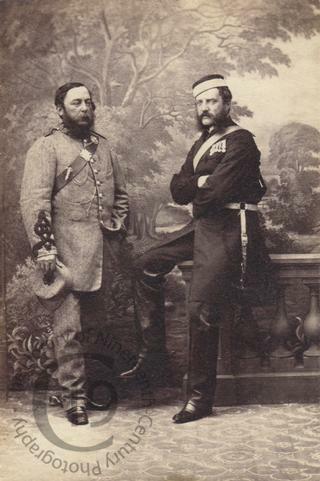 A carte-de-visite portrait of Captain Alfred Augustus Malet (1814-1898) and Colonel Gustavus Hume (1826-1891). Alfred Augustus Malet was born on 29 August 1814 at Wilbury House, Newton Tony, Wiltshire. His father was Sir Charles Warre Malet, 1st Bart. He served as a Captain in the 8th Regiment of Foot then subsequently in the 1st Somerset Regiment of Militia. On 20 June 1840 he married Ellen von Passow. He died on 21 March 1898, aged 83. Photographed by John Webber of Taunton in Somerset.